Stay Right Here a Little While...: FUGAZI'S "13 SONGS"
Fugazi are an excellent band that play a sort of mid-paced but highly energetic brand of punk. Like X and Nomeansno, , the bass carries the rhythm and the majority of the melody, with the guitar coming on full force only when needed. The vocals are almost spoken and take a few listens to get used to, but they suit the music just fine. 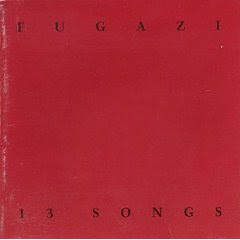 The best thing about Fugazi is their highly infectious catchy choruses and the way the bass carries the music along, always in the groove. "13 Songs" is a great place to start if you're interested. An incredible album, simple but contagious. One of my favorite tracks is "Waiting Room". Check it out.